The queen hard at work. Jane and Stucco: a meeting of 2/3rds of the Elder Countil. 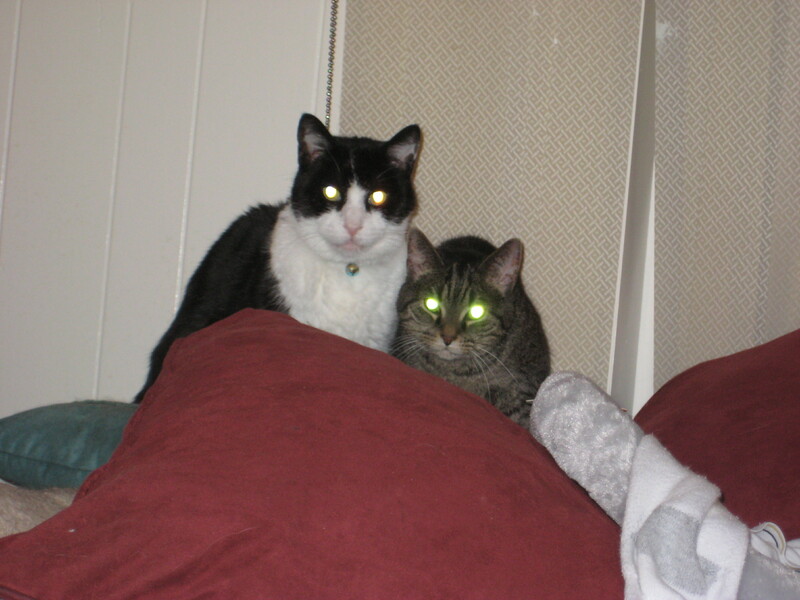 Now with LASER EYES. 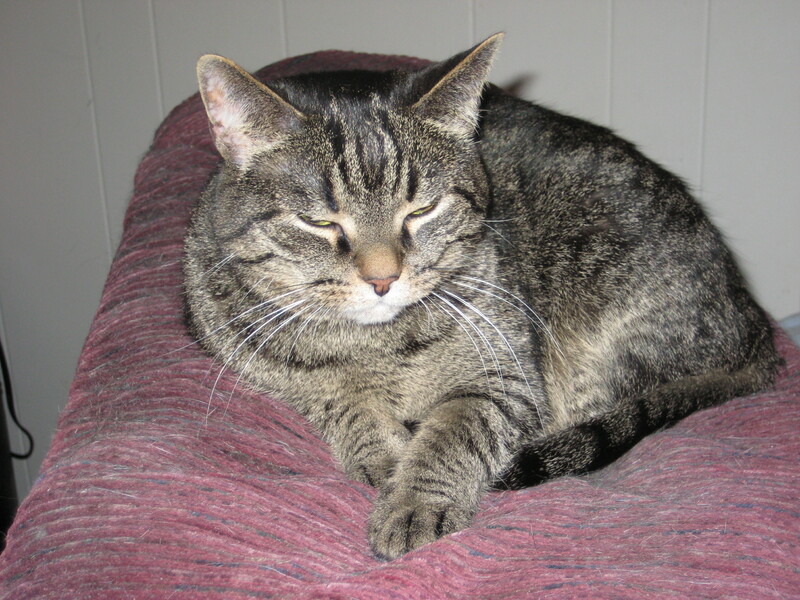 It is with great sadness that I announce the permanent retirement of the senior member of the Feline Supervisory Committee, Jane, AKA Janeway Yowlin of Puxhill, AKA &http://www.michaelmjones.com/#8220;The Tabby.&http://www.michaelmjones.com/#8221; At the dignified age of 14 or 15 (a lady never tells her true age), Jane chose to move on to her next life, rather than hang around and put up with lymphosarcoma any longer. She is survived by the rest of the Feline Supervisory Committee, who have already announced their intention to uphold her tradition of sleeping on things, shedding, and looking faintly disapproving at whatever it is we did. 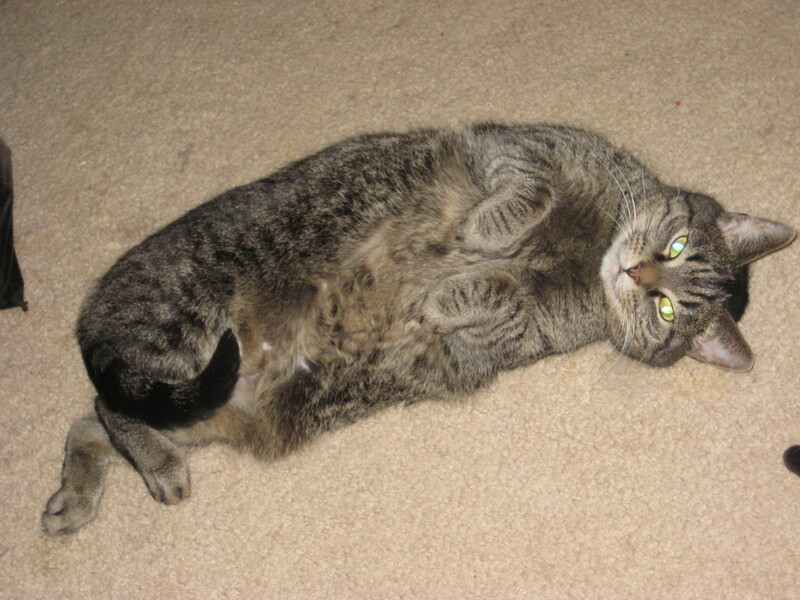 Jane came to us as little more than a kitten, via the local shelter, when we announced an opening for a tabby. She quickly proved ideal at the role, and soon settled into a life of leisure and doing cat things. As she gained seniority, she was promoted to the Elder Council, of which she was the surviving member, following last year&http://www.michaelmjones.com/#8217;s retirements of Stucco and Gabriel. (The Elder Council has been effectively disbanded, and a new grouping will be announced at a later date.) Also, with her passing, the informal &http://www.michaelmjones.com/#8220;Family Unit&http://www.michaelmjones.com/#8221; is likewise disbanded due to attrition; its only remaining member is Pepper, who has been promoted to Chief Shrieky-Beast. Jane was born old&http://www.michaelmjones.com/#8211;she was always a little grumpy, enjoyed her solitude and deep thoughts, and became extremely prickly when picked up. She enjoyed singing jazz and the blues, and would have won numerous prizes for math and science if only she had the opposable thumbs to communicate her findings. We may never know exactly what she discovered during her many hours of contemplation. She was greatly loved, and goes to her next life with the highest of recommendations and references. Should you encounter a grey/brown tabby with a slightly sour manner, a rusty motor purr, and deep thoughts, know that she served long, well, and honorably. The Feline Supervisory Committee and her silly, sentimental owners, thank her for many years of excellent service, and wish her all the best. She will be missed immensely.